The Deftones' new album Diamond Eyes is a rousing return to form for the Sacramento, California-based band. Only thing is, it isn't the record they were planning to make. Not by a long shot. "We were kind of forced to make this album by circumstances that definitely were not of our choosing," says guitarist Stephen Carpenter. "Although we're very proud of it and, in many ways, we do think it's one of the best records we've ever made, a big part of us wishes things would have turned out much differently." For a while the group (the lineup also includes singer-guitarist Chino Moreno, drummer Abe Cunningham and DJ/keyboardist Frank Delgado), which had almost finished recording an album to be called Eros with producer Terry Date, held out hope that their friend and bandmate would recover and rejoin them, but when it became sadly apparent that Cheng's condition was of a permanent nature, they enlisted Sergio Vega (ex-bassist for Quicksand) to help them out. "I was more than happy to step in," says Vega, "but at the same time I wish things weren't what they are. Basically, I'm trying to help the band make the best of a very tough situation, and I think we've all come through this ordeal extraordinarily well - and with an album that's pretty darned terrific." Diamond Eyes, produced by Nick Raskulincz (Rush, Foo Fighters) is a sonic joyride, and a surprisingly upbeat affair. "We didn't want to make a downer album," says Carpenter. "What would be the point in that?" 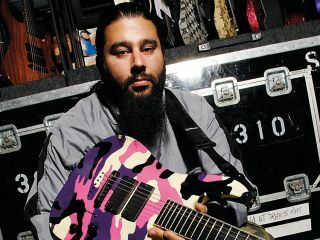 On songs such as Rocket Skates and the title cut, the group, true to their signature sound, shift deftly from a whisper to a scream, with Carpenter creating intoxicating blankets of guitar textures and new man Vega contributing nimble, rolling basslines that fit seamlessly in the Deftones' pockets of shadows and light. MusicRadar recently sat down with Carpenter and Vega to find out the status of Chi Cheng, and also how the band triumphed over what many saw as insurmountable odds. Diamond Eyes is such an impressive record. How close were you to finishing Eros, the album you were recording at the time of Chi's accident? Carpenter: "We were about 70-75 percent finished with Eros. Musically, we were completely finished with that one - we were just waiting for Chino to finish the vocals, and I'd say he was more than half done." How is Chi? What's the status of his condition? Carpenter: "At this very moment, I can't really say. Fans can always get information on the oneloveforchi.com website. Last time I saw him, he was just out of his accident. That was… I don't like to see my friend like that, so I'm… I'm kind of detached from it." I can imagine how difficult it must have been. Was there any discussion, on any level, as to whether you were going to continue to be a band? Carpenter: "At the time it all went down, all I ever thought about was what was best for Chi, you know? As to us being a band or not, there was never any question that we would continue. We're going to be a band until we're old and we'll stop when we're dead. That's how that goes." How long was the period between putting the Eros record to bed and deciding to start a brand-new album? Carpenter: "I'd say it was a four-month window where we were just sitting around. Nothing was really going on. We were just focused on Chi and waiting to see what was going to happen. His accident was in November of 2008 and we didn't really start back up again till February or March of the following year." Terry Date, your longtime producer, was working with you guys on Eros. What made you decide to go with Nick Raskulincz on Diamond Eyes? Carpenter: "From my perspective, it really came about when Chino was writing his vocals. For our last couple of records, the people that surround us had no confidence in his hit songwriting abilities, so they were always trying to hook him up with hit songwriters and producers. He ended up meeting Nick, who turned out to be an awesome dude. When Chino brought Nick in to meet us, we thought he was great. He's a big fan of ours and he really made the experience a very enjoyable, productive one." Sergio Vega: "He knew what the band was about and he didn't want to change us. He'd even pull me aside and hum Quicksand riffs, so that made me feel very comfortable with him right away." Carpenter: "Yeah, that's a key thing right there. He doesn't come in and try to make a band something we're not. He was one of us and his instrument was the SSL. He just wants the band to be the best at what they are and do their best. He wasn't trying to get us to write hit songs - whatever those are. Who knows what a hit is, you know?" How did it come about that you guys brought Sergio into the band? Carpenter: "This goes back a few years. A while back, Sergio filled in for Chi when he had a staph infection on his foot. We had a tour with Black Sabbath and Pantera and we didn't want to cancel, so we gave him a call and he came out and learned our entire set in 24 hours. It was as if he was in our band the entire time. So when the accident happened, once we gave thought as to who we should cal, Sergio was the dude." Moving forward, how is this going to work? Is Sergio viewed as permanent member of the band? Vega: "I look at myself as the sixth man off the bench. We've been friends for a long time and I've always loved the band. I look at the band as family, in whatever form that takes." Carpenter: "We have many band members. They're just not always present all the time." Explain to me the process of how the band came back together after Chi's accident. Did you demo new material? How did you go about starting a brand-new album? Carpenter: "We followed two approaches, really. We'd demo a little but mostly we'd jam. Nick would record our jams and he'd key in on what he thought were cool things, so we'd jam some more, and then before you knew it we had a song. So, really, most of the songs came about from us jamming and Nick recording what we were doing. He'd help us shave the rough edges off of what we were doing." Vega: "It was all about capturing energy and a new dynamic in the band. I'm not saying that egotistically, but I think everybody was feeling very positive and full of spirit. We were all psyched to be playing together, and that translated into a lot of cool music. Our whole m.o. was come in, play, listen, play some more, listen - the process was gradual but intense, but always exciting." Carpenter: "Although we did use a different producer, the process itself was pretty similar to what we've always done. The only thing that was different in a big way was that we didn't go in thinking, Hey, we've got as much time as we want. We'd already made an album and put it on the back burner. Now we had to crank it out, so to speak. Time was of the essence. We were super-focused." So Nick was pretty much rolling tape while you guys were jamming? Carpenter: "Yeah. And it got results: We had something like eight brand-new songs down in two weeks. That's very fast for us. At this point, I'd tell any band, 'If you want to make a great record, do it with Nick.' The guy definitely knows how to motivate musicians and keep them focused and make them feel like what they're doing matters." Stephen, I want to ask you about your sound on this record - and that of the band, as well. It's pretty unique. What you do isn't based around guitar riffs, it's more of a sonic wave. Carpenter: "That's a hard thing to ponder, man. You know how you sometimes have to get in a crowded elevator, and you think for a second, Do I get in or should I just wait? Well, with this band, I feel like I'm the guy about to get on the elevator, only I don't have that luxury of waiting. I just have to crash my way in, you know? But I don't mind. And I also don't ever feel like I'm doing something unique or spectacular; I'm just enjoying myself with my friends and we're all in it together." It's interesting you use a crowded elevator analogy, because your songs do sound dense, like a wall of sound. Vega: "I think what was happenig on this record was that Stephen wasn't getting the chance to think of riffs to kick songs off with - not like he normally would. On this album, we'd sit around having smokes, then when it was time to jam we'd get up and sort of blast off. Maybe that's why it sounds so…dense. We were all just going for it." Sergio, I know your basslines from Quicksand very well - very fluid, rolling parts. Did you alter your approach at all with Deftones? Vega: "No, not really. I did everything exactly the way I did in Quicksand. I'd pick up the bass and start riffing, and if people felt it, they stated playing along. And vice-versa. I think my style has been one that's really worked out with the Deftones. "This has been a really incredible experience for me, personally and musically. When I was in Quicksand, I always felt that people didn't understand my contribution and it was hard to get my ideas across to the other guys. But with the Deftones, they brought me in and allowed me to contribute right away. It's been very gratifying." Stephen, how many guitars tracks do you generally put on any given song? Carpenter: "On this record, it was predominantly two tracks, one hard left and one hard right. On a couple of songs I might have put another additional stereo guitar for atmosphere, but that wasn't the rule." What were your primary guitars? Carpenter: "My one and only guitar, which is an my signature ESP eight-string guitar. The tuning is basically the same as a six string, except for the bottom two which are [from high to low] a B and an F#." So what kind of chords are you forming with that? Carpenter: "Barre chords, man. You got your root and your fifth. It's a massive sound." Amp-wise, what are you using? Carpenter: "My main amp for the last ten years has been a Marshall JMP-1 preamp and their power amp, the EL34. I have two sets of cabinets. The first set is running the stock Celestion 75-watt speakers, and then I have two Marshall 4 x 12s, and they both have 80-watt Celestions in them." Crpenter: "I've got a lot of goodies, but I don't use them all the time - and I didn't use a lot of them on the record. Let's see… I've got a lot of Dunlop and MXR pedals that I just reconfigured my system with. Then I've got some Z.Vex pedals that are pretty cool. One component that I always use is my Rocktron Intellifex; it's an older unit that I've been using for about ten years, ever since the White Pony album. Oh, and I also used the Native Instruments Guitar Rig 3." Sergio, what kind of basses did you play on the album? Vega: "There were a couple of Fender Jaguars that I used, both in different tunings. One was in C# and the other was in C. And my primary sound source was also the Guitar Rig 3." Carpenter: "It's an awesome system. We use them on stage - we've got our laptops up there with us, it's pretty cool." And what's great is, when you're not playing, you can check your e-mails. Carpenter: "We're blurring the lines of time on stage. Pretty soon we'll just start sending out our concerts from the cameras on our laptops." Obviously, nobody's happy with what happened with Chi. But in a weird way, does this feel like something of a rebirth for the band? You're joking, of course. But you know what I mean - this feels like a real 'triumph over adversity' tale. Carpenter: "Oh, absolutely. We're having a good time. It's a duality for us. On one hand, we're dealing with the fact that our friend isn't with us and his life has been forever altered; on the other, we're all together and we're enjoying life to the fullest and getting on with things - which is all you can do, really."